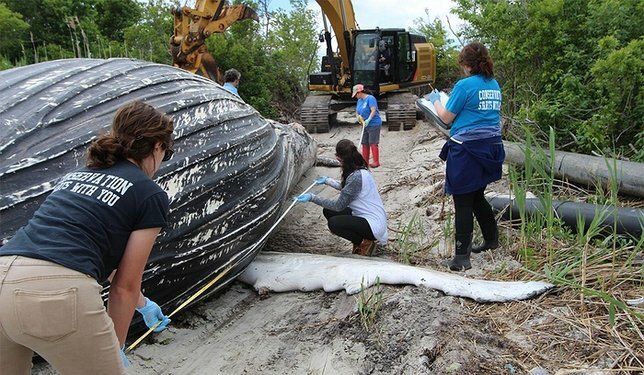 The Atlantic Marine Conservation Society (AMSC) responds to a deceased humpback whale. The NOAA John H. Prescott Marine Mammal Rescue Assistance Grant Program is a key source of funding for marine conservation advocates and researchers to aid in the recovery and treatment of stranded marine mammals. This critical program is funded under the NOAA research budget and last year Congressman Zeldin voted to fully fund NOAA research at $3.24 billion for FY 2018 (H.R. 3354). Atlantic Marine Conservation Society’s (AMCS) mission is to promote marine conservation through action. This is accomplished through education, research, and response. AMCS is the lead large whale response organization in New York State. As a non-profit organization, the society conducts research projects within the marine environment, and responds to whales, porpoises, dolphins, and sea turtles in the northeast region, and conducts public and private education programs across Long Island into New York City. Partnering with other organizations within the stranding network, AMCS is supported by the Specially Trained Animal Response Team (START), Pacific Marine Mammal Center (PMMC), and National Oceanic and Atmospheric Administration (NOAA). Subject: LongIsland.com - Your Name sent you Article details of "Rep. Zeldin Announces $100K Grant for Atlantic Marine Conservation Society"